Upon his death in 1881, Friedrich Muench left a codicil to his will giving specific instructions to his children “to gather all of his personal papers and writings” and place them at that institution at St. Louis, and make them available to the public. That institution today is the Missouri History Museum’s Library and Research Center at St. Louis, Missouri. This contribution has enabled members of the Traveling Summer Republic, the historians, artists, photographers, and archivists in both Germany and the U.S., to use them in the exhibit Utopia – Revisiting a German State in America, bringing this nearly forgotten story alive at the beautiful Missouri History Museum in St. Louis, where it has been enjoyed by over 40,000 visitors since it opened November 23, 2014. This unique exhibit was funded and created in Germany, and opened originally in Giessen, Germany on November 1, 2013. It has traveled across Germany to Bremen, then to the U.S. and the prestigious German American Heritage Museum in Washington, D.C., before arriving at St. Louis. The exhibit’s story opens in 1799, when the Giessen Emigration Society founders Muench and Follenius were born, explaining the horrific conditions of Germany at that time. We follow them through their years at the Giessen University and their involvement in the student uprisings of the Giessen Blacks. They struggle with the difficult decision to emigrate, issue a Call for Emigration, only to discover thousands want to join them. Their goal of a better life for their families, to be found in United States is reached only after many difficulties. In Missouri “where the sun of freedom shines” they build new lives on the far western frontier. This is not only the story of 500 brave Germans of all religions and walks of life, but many of the Germans emigrating to Missouri in the 1830s. 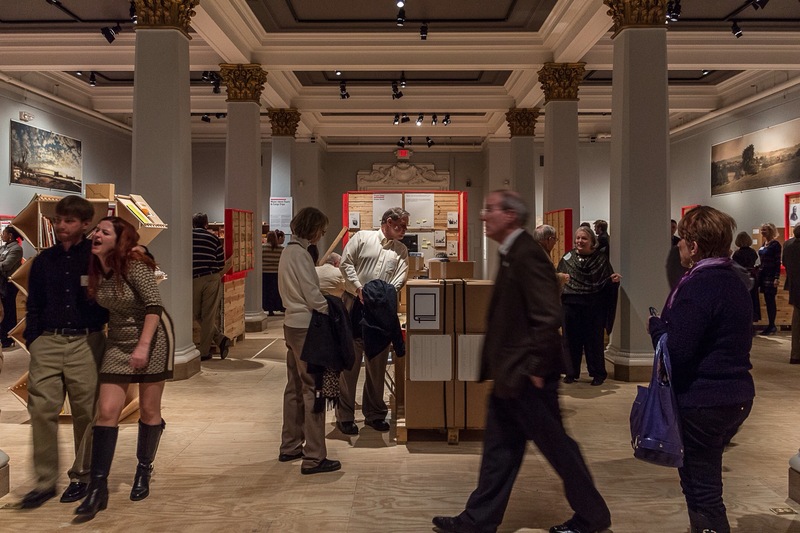 The exhibit will close its doors for the final time on Sunday, April 19, 2015 and return to Germany. Over 100 descendants have shared their family’s history make this exhibit possible. We invite you to share in the events for the closing weekend at the Missouri History Museum, and meet the entire team of the Traveling Summer Republic, the photographers, designers, film makers, writers and historians, who have brought this nearly forgotten story to life. We invite you to be part of this special event. Their partnership with the families who have contributed their photographs, diaries, writings, drawings, and more, have made this a truly wonderful international exhibit. 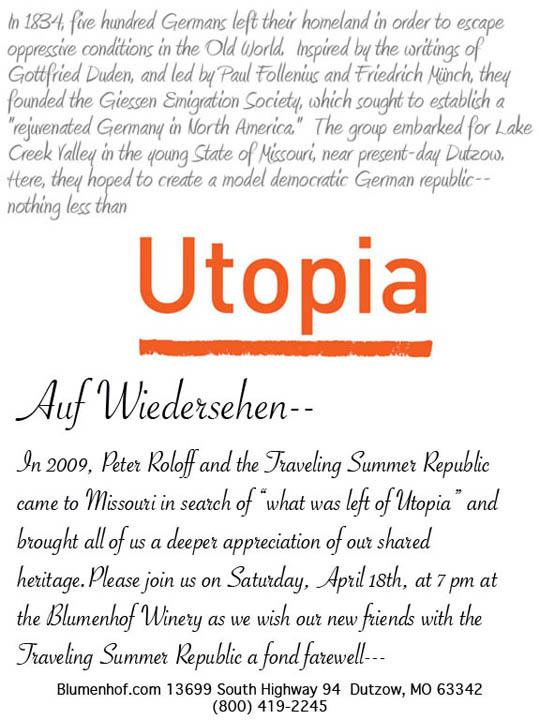 There will also be a special opportunity to meet and say farewell – Auf Wiedersehen – one last time to the Traveling Summer Republic on Saturday, April 18, 2015 at 7 pm at the Blumenhof Vineyards and Winery in Dutzow. Everyone is invited and no reservations are necessary. If you are a descendant of a member of the Giessen Emigration Society we would like to hear from you. Please use this form to contact us! 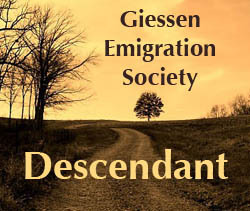 Visit the Giessen Emigration Society, read their Call for Emigration, and see the list of Members of the Geissen Emigration Society, or the Ships list for more information.